Best grown in organically rich, medium moisture, well-drained soils in full sun to part shade. Sharp soil drainage is particularly important. Best in full sun in the northern part of its growing range, but appreciates part afternoon shade in hot summer climates such as the St. Louis area. Performs poorly in the heat and humidity of the deep South (south of USDA Zone 7). Best performance generally occurs in climates such as the Pacific Northwest where both summer and winter temperature are moderate. In St. Louis, it is best planted in protected locations to minimize risk of damage from sub-zero winter temperatures. If trained as a small tree, root suckers must be removed as they appear. Also consider removing the seedpods as they appear because they are not particularly ornamental, they consume plant energies and they are quite poisonous. Laburnum anagyroides, called common laburnum or golden chain tree, is a small, low-branched, deciduous tree or large shrub that is native to the mountains of central and southern Europe. It typically grows to 15-25' tall. It is perhaps most noted for its profuse and showy late spring bloom of yellow flowers in dense, pendulous, wisteria-like racemes (to 4-8" long). Trifoliate leaves with elliptic-lanceolate to obovate leaflets (each to 3" long) are a dull green to gray green with pubescence underneath. Foliage produces no significant fall color. Pea-like fruits in seed pods to 2" long ripen in fall. All parts of this plant, particularly the seeds, are very poisonous (cytisine). 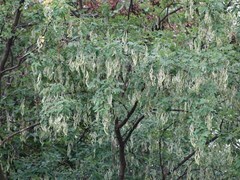 An additional common name of golden rain is popular for this tree in Europe, but not in the U.S. where golden rain is usually reserved for Koelreuteria paniculata. The title character in Daphne du Maurier's novel, My Cousin Rachel (1951), may have killed her husband Ambrose with laburnum seeds. Specific epithet means resembling the genus Anagyris. Twig blight is an infrequent but potentially serious disease. Canker and leaf spot are lesser disease problems. Watch for aphids and mealybugs. Use gloves when working with this plant. Educate children as to poisonous plant properties. Small specimen tree. Also may be grown as a large shrub. Train for arbors, pergolas or espaliers. Good background plant. Plant on an incline or slope to help prevent the development of excess soil moisture. Laburnum x watereri is a popular hybrid of L. anagyroides x L. alpinum. It is generally considered to be a better landscape plant that either parent and produces fewer seed pods.